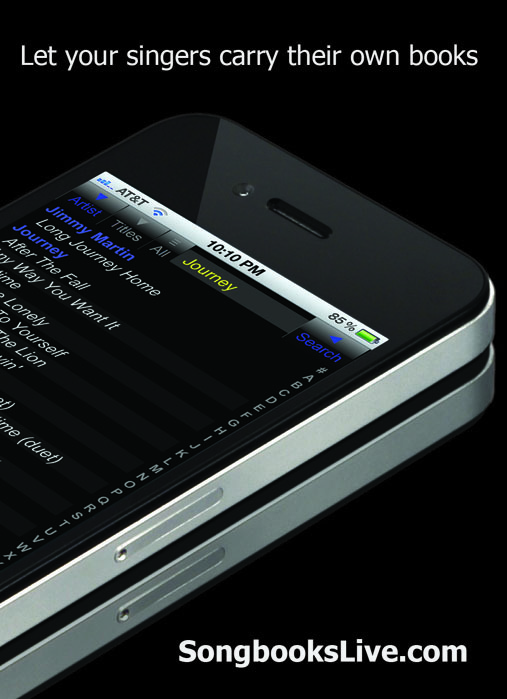 Songbooks Live stores searchable databases of karaoke songs which can be viewed on any smartphone 24 hours a day from anywhere, eliminating the need for costly paper books. For only $29 a year, KJs can store and display their songbooks live 24/7, and unlike paper books, there is no additional cost to update the songbooks, and updating a songbook is simply a matter of a few mouse clicks. No printing costs, no binders, no more carrying heavy books to shows, no more stolen books, and never again will you run out of books. Now singers can have your constantly updated songbook at their fingertips at home or on the go, giving them unlimited time to browse songs to sing at your next show.